Lock it Down with Locker Installation! If you were asked to define what makes for a good business, there are certain words that no doubt spring to mind. These are words that you’d hope describe your own business: reliable, meticulous, high-quality. But are you looking for a word that is the hallmark of a great business? Organization is the basis that allows you to meet those other business goals efficiently and effectively. And with lockers and professional locker installation, you will be one step closer to taking your business to this next level. What Purposes Do Lockers Serve in My Business? There are a wide range of uses your business can get out of lockers. Regardless of what kind of company you run, lockers provide you with accessible storage, protection and security, and most importantly, a means of organizing either your inventory or your personal belongings. Using lockers as the primary organization tool in your warehouse or other type of building ensures that your can use your space in a logical way without having to worry about clutter or misplaced items. Can I Get Lockers That Are Custom Designed? Because there are so many different ways to use lockers in your business, there have to be equally as many designs of lockers available to you. S.W. Betz can work with you to determine what dimensions of locker will best suit your needs, as well as whether specialized compartments or accessories can help improve your lockers. We can also help you decide whether steel or wire mesh lockers will be the right choice for your business. 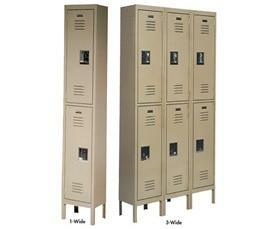 Why Should My Lockers Be Professionally Installed? Professional locker installation is an absolute must for your business. Lockers can constitute a large investment, depending on the type and number of them you need, and you can only guarantee that this investment is protected by having the experts take care of the installation process. You want to be certain that your lockers are secured and safe to use and that they are optimally positioned within your facility. Professionally installed lockers greatly increase your business’s ability to stay organized and, as a result, stay ahead of the rest of the pack. This entry was posted on Thursday, November 13th, 2014 at 2:22 pm. Both comments and pings are currently closed.